View of the tranquil scenery around Rydal Water in Cumbria. The lake is overlooked by a single cottage, which was at this time the home of essayist and critic Thomas De Quincey. 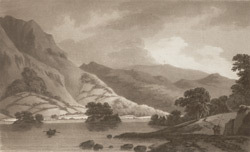 Wordsworth lived nearby, advising visitors to the area: "Rydal mere is nowhere seen to advantage from the main road. Fine views of it may be had from the Rydal Park; but these grounds, as well as those of Rydal Mount [the poet's home] and Ivy Cottage, from which also it is viewed to advantage are private." The foot road and horse road also provided better views.